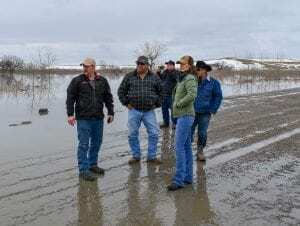 On Monday, March 25, Governor Kristi Noem toured areas along the Moreau River that are affected by flooding. CRST has been in a State of Emergency since March 5, and requested the state to assist with snow removal after storms “experienced more than 30” of snowfall since the beginning of the year” according to the emergency declaration. 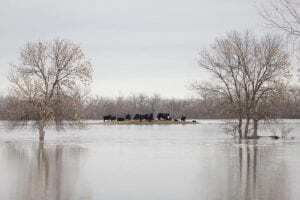 The snowfall, high winds from bomb cyclone Ulmer, and warmer temperatures resulted in rapid snow melts and river ice jams, which in turn resulted in flooding and dam collapses throughout the state. Run-offs into rivers such as the Cheyenne and Moreau increased water levels while ice jams began to form, especially at bridges, which caused bridges and roads to overflow. Road closures due to inundation were beginning and many on social media began sharing photos and videos. Tribal officials called for volunteers to go out to CRST Game, Fish and Parks this weekend to help fill sandbags and crews worked on roads in an attempt to prevent washout and damages to bridges. Evacuation centers were established in White Horse, Timber Lake, and Eagle Butte in response to the flooding. State Representative Oren Lesmeister said seeing the people’s concerns prompted him into action. He contacted the governor to inform her of the flooding that has occurred on Cheyenne River. Earlier in the week, the governor surveyed flood damage on the Pine Ridge reservation, where she sent the South Dakota National Guard to help distribute water to communities devastated by floods. “Just seeing people posting and calling, I thought about it and decided, even if the state cannot help directly, at least make them aware and hopefully be proactive [rather] than reactive…I made a call to let them know what was happening and things took off from there. The next morning, she was here,” said Lesmeister. On Monday morning, the governor and her staff arrived at the CRST Environmental Protection Department building and met with Chairman Harold Frazier, members of his staff, Treasurer Benita Clark, and key tribal department heads of the Environmental Protection Department, Transportation, and Property and Supply. Also present at the morning meeting were Tribal Council Representatives Bob Walters and Tater Ward, Representative Lesmeister, and Bureau of Indian Affairs Acting Superintendent Gina Douville. According to CRST Intergovernmental Affairs Coordinator Remi Bald Eagle, the group had a long discussion on tribal and state capabilities and conferred how each are operating in their emergency responses. After the meeting, the group caravanned to areas and communities along the Moreau River to assess flooding by way of On The Tree Road to White Horse. The group stopped at White Horse Bridge and witnessed an ice jam and overflow of flood waters. They also a saw group of cows stranded on an island, said Bald Eagle. Upon completing their assessment at the bridge, the party traveled to White Horse for lunch at the White Horse Community Center. Community volunteers served chili, beef stew, biscuits, frybread, and drinks. 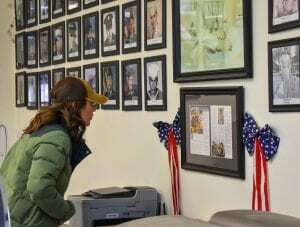 While there, the governor visited with community members and looked at veteran photos posted in the center. After lunch, the group planned their route to Promise and because BIA Route 3 was flooded, they traveled to Glad Valley near Mobridge, and took Red Top Road. They stopped at Handboy Creek along the way where the group witnessed water rising so quickly that it caused them to retreat Bald Eagle said. Once in Promise, the group inspected Promise Bridge and the Moreau River. Bald Eagle said the river was running high and ice chunks could be heard hitting the bottom of the bridge as they were carried away by the swift current. 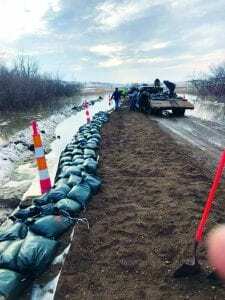 According to Bald Eagle, Governor Noem expressed concerns for the damaged roads and spoke about getting FEMA assistance to offset the Tribe’s expenditures during their emergency response operations. “Drove to Eagle Butte and White Horse today to see the effects of recent floods. The rising water is eroding infrastructure and stranding wildlife. There’s lots of work to be done here,” wrote Noem on her Facebook post. Noem’s visit is a good step toward establishing a productive partnership during these trying times said Lesmeister. “The biggest hope is communication and cooperation between state and tribe. The reason I made the phone call to let the governor know what is happening here is because there are times that on both sides, you need to ask for help in times of need. Both sides need to do a better job of communicating. My hope is that this is the beginning,” said Lesmeister. 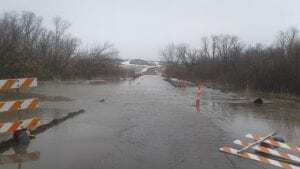 On Tuesday, March 26, the Quinn Damn in Pennington County completely breached, causing a temporary closure of Interstate 90 between Wall and Philip. Such breaches are a major cause for concern said Bald Eagle, who emphasized that flooding of the Moreau River is a major event. According to the National Weather Service Advanced Hydrologic Prediction Service report, as of March 26, the Moreau River has risen to 30 feet, a new historic record. The waters may continue to rise as more snow and ice melts. “This is a major flood event. The Moreau River is currently well above flood stage and is continuing to rise. Do not be fooled if the level of the river is lower in some spots versus others. The river will rise and is going to continue to rise higher than any previous historic record. We are expecting major flooding in White Horse and Promise areas. We are urging all individuals living in those low areas to seek shelter on higher ground. Even if your homes are not inundated, your roads will be, which may not allow medical or law enforcement to go in and out of those areas,” said Bald Eagle. The public is urged to stay updated on flood conditions, road closures, and new (if any) evacuation centers by listening to radio announcements, information posted on official tribal social media outlets, and law enforcement services. The CRST Command Center is manned 24 hours a day and can be reached at 605-964-6558/6559. If there is no answer, leave a message, and someone will return your call. If there is an emergency, call 911. A herd of cows are stranded on an island near White Horse bridge. The herd has since reportedly returned to dry lands. The Episcopal Church in Promise sits in flooded waters as inundation continues.